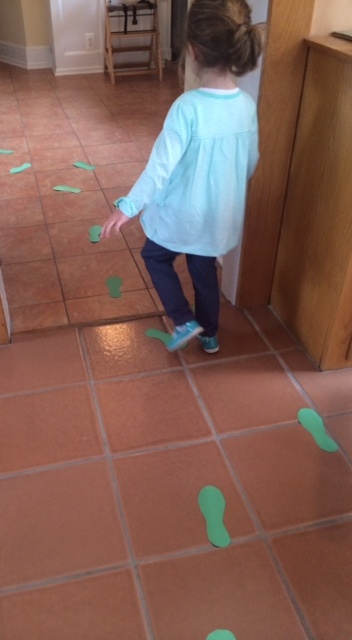 By far my favorite activity to do with kids on Saint Patrick’s Day is a game in which I have the kids follow leprechaun footprints. All you need to do is cut out foot prints from green construction paper or spray your footprints in the snow with green water. Then hide small treasures of gold coin candy around the house or yard. Sprinkle the footprints as a trail for the kids to follow to find the treats the leprechaun left them for St. Patrick’s Day. 1. Start by washing out the spray container extremely well. You don’t want to be spraying cleaning chemicals all over the lawn. 2. Add water and several drops of green food coloring. 3. Shake up the bottle and put the top on tightly. 4. 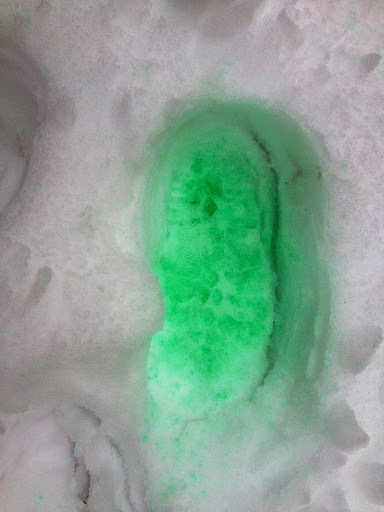 Stomp a foot print in the snow and spray it green. 1. After following the directions above to get a spray bottle clean, let the little ones fill the container with water and put in quite a few drops of food dye. The more dye they put in, the more vibrant the end color. 2. Shake up the bottle and put the top on tightly. The kids have an entire canvas to decorate outside – no one wants to spill all the “paint” early. 3. Bungle up, go outside where it has snowed, and let the spraying begin! « Study Says Praising Kids Makes Them Narcissistic Brats — I Say Phooey!